What are the green glowing bubble creatures that the young scientist-inventor encounters in the depths of the Pacific Ocean? How do they rescue Tom and his pal Bud Barclay from an attack by the fish men? Tom's electrifying adventures begin deep in the Mariana Trench where he has based his newest invention, the Dyna-4 Capsule, in a hunt for rare metals. A super submarine, the craft has been especially designed for deep-sea research and exploration. On orders from Washington, Tom takes time out from his own project to recover5 a stolen vial containing a highly destructive explosive. The top-secret mission turns into a danger-filled whale chase in the Dyna-4 and leads to a showdown with Tom's ruthless foes. The main invention in this book is the Dyna-4 Capsule. The Dyna-4 Capsule (christened by Bud as "the Egg") is the Flying Lab of the ocean. 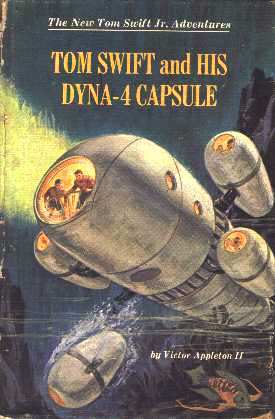 According to the book, the Dyna-4 is: "an underwater super laboratory, especially designed for investigation in deep-sea environments. It consisted of a central control-and-power unit with four laboratories attached to it. Each was equipped for work in a different branch of science -- biology, geology, chemistry, and metallurgy." Where did the name come from? Well, "We got the name Dyna from the Greek word dynamis, which means power," Tom explained. "The Dyna-4's central body was constructed of Tomasite in movable, overlapping segments for compactness, but it could be expanded into a long cigar-shaped vehicle for maneuverability in narrow places. The four labs, also cigar-shaped, would fit snugly against the central body when the struts were retracted. Fully equipped with its own pilot-control unit, each capsule was self-operating and could be detached for individual research projects. Passageways in the struts provided easy access to and from the main capsule and smaller labs. One interesting fact about the Dyna-4 is that Tom used the Flying Lab to move the enormous Dyna-4 to off the coast of Japan. This is very interesting, as it really shows the true immensity and strength of the Flying Lab. The 4 side labs, by the way, are held onto the main unit by electromagnets. How feasible is it to build a Dyna-4 Capsule? Well, that depends. Vehicles that are equipped with all the instruments and size of the Dyna-4 have been built. However, their use is restricted to the shallows of the ocean floor -- if they ever tried to descend to the bottom of the Marina Trench they would be completely squashed. The reason for this is because it takes an extraordinary alloy to withstand the enormous pressure that an ocean provides at such a depth. To build even a small, basic submarine that can negotiate the most extreme ocean depths requires some extremely thick coatings of the strongest materials known to man. To build a vehicle in the style and size of the Dyna-4 you need to find a way to truly conquer the enormous weight of an ocean. Metals -- perhaps plastics -- of amazing durability and strength are required. Until such metals are devised, the Dyna-4 will remain a dream. How much impact would a Dyna-4 Capsule have on civilization? The Dyna-4 would be extremely useful in undersea exploration and settlement. If you ever needed to explore the extreme depths of the ocean the Dyna-4 would definitely be your choice as not only is it large and maneuverable, it is also completely equipped with whatever equipment you would want to provide. "As you both know," Tom began, "seawater contains not just salt, but almost every element in the periodic table is compounded with it. The Insta-Rock gun shoots a special catalyst I've developed thatÖcauses reactions of the calcium and other minerals in the seawater to precipitate insoluble carbonates. This is instant rock. " "As you're well aware, Tom, light is filtered out in water in progressively greater depths at ever shorter wavelengths. The red end of the spectrum disappears first within a few hundred feet. The short blue waves are the last to go." "Magna Eye is actually an electro-optical system that reduces the frequency of the ultraviolet radiation so that it falls within the visible range. The goggles also intensify any visible light by one thousand times." "And so, with them on, one can see anything on the ocean bottom clearly," Tom put in. "Basically, this works like Magna-Eye -- it amplifies high-frequency sounds to within hearing range. Simply adjust this dial and a mini-electronic selector inside will automatically erase any sonic interference as it tunes in to selected vibrations."